Saying that Israel faces daunting challenges today and that those challenges will multiply and grow in the near future should not be construed as a partisan or ideological statement. Rather, it is a statement of fact. It is also a fact that the greatest dangers facing Israel stem from President Barack Obama’s rapid withdrawal of the US from its position as the predominant power in the Middle East on the one hand, and from Iran’s rise as a nuclear power and regional power on the other. These power shifts along with the Muslim Brotherhood’s rising power in Egypt; Turkey’s Islamist government’s regional ambitions; the rise of jihadist forces throughout the Persian Gulf; and the growing instability of the Syrian and Jordanian regimes, together constitute a threat environment unmatched in Israel’s history. Alongside these conventional threats, Israel is the target of a sustained, escalating political campaign to delegitimize its right to exist and its right to defend itself by the Palestinians and the international Left. 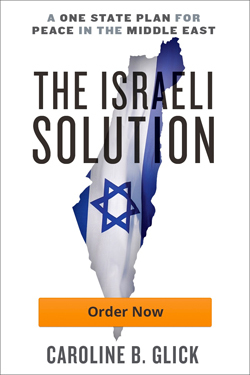 This campaign threatens Israel’s economy and prepares the ground for violent aggression against Israel by conditioning the West to believe that Israel deserves to be attacked. Given the magnitude, multiplicity and complexity of the threats Israel faces, it would be reasonable to expect our leading politicians from all parties to place patriotism above partisanship and at least on the issues that are beyond dispute to work together to defend the country. And it would seem reasonable to assume that the issues beyond dispute are Israel’s right to exist and defend itself as well as its need to deter or defeat its enemies. Throughout most of the state’s 63 year history, opposition leaders have joined forces with the government to defend the country in times of trouble. Most recently, while serving as head of the opposition during Ehud Olmert’s tenure as prime minister, in 2006 Binyamin Netanyahu traveled to Europe at Olmert’s request and defended Israel’s war against Hezbollah. During the course of hostilities, Netanyahu never criticized Olmert’s poor war leadership in public. He did not publicly criticize then-foreign minister Tzipi Livni’s scandalously incompetent handling of the cease-fire negotiations at the UN Security Council. Instead, Netanyahu communicated his criticism to Olmert behind closed doors. As he saw it, public criticism would diminish Olmert’s ability to win the war. Shortly after Netanyahu took office in March 2009, the UN released its libelous Goldstone Report in which Olmert and his government were falsely accused of committing war crimes during Operation Cast Lead in Gaza. Although Netanyahu himself was not mentioned or accused of anything, he led a staunch campaign to discredit the report. Netanyahu didn’t act as he did because he wanted to help Kadima. He acted as he did because he realized that it was Israel, not Olmert and Livni, that was under attack. As prime minister and as opposition leader, it is his job to defend Israel from attack even when the most direct beneficiaries of his actions are his political rivals. NETANYAHU’S DECENT behavior didn’t make him a hero. His behavior is the minimum we can and should expect from our elected officials, whether they are in the government or the opposition. We should be able to reasonably expect that those who seek public office with the declared intention of serving as national leaders will always put the national interest above their partisan interests when the two conflict. Unfortunately, this fundamental, eminently reasonable expectation is being trampled by opposition leader Tzipi Livni today. Since taking the helm of the opposition, Livni has never been willing to recognize that foreign attacks on Netanyahu are quite often attacks on Israel. Rather than acknowledge that attacks on the legitimacy of the democratically elected government of her country are attacks on her country, Livni has viewed every attack on Netanyahu as an opportunity to weaken his government. In this vein, Livni has consistently sided with Obama, the Palestinians and the international Left against Netanyahu, and blamed Netanyahu for their attacks on Israel. For instance, when during his visit to the US in May, Netanyahu rejected Obama’s hostile call for Israel to retreat to the indefensible 1949 armistice lines, Livni defended Obama as a friend of Israel and accused Netanyahu of harming Israel’s ties to the US. Indeed, Livni called for Netanyahu to resign. Livni ignored Obama’s shocking renunciation of pledges his predecessor made to the Sharon government regarding Israel’s right to defensible borders and US rejection of the Palestinians’ demands for unlimited immigration to Israel and for Israel to vacate all the Israeli towns and villages built beyond the 1949 armistice lines. As for the Palestinians, as far as Livni is concerned, they can do no wrong while Netanyahu is in office. Although the Palestinian negotiations department documents that were leaked earlier this year to The Guardian show Livni arguing that the Palestinians have to recognize Israel’s right to exist as a Jewish state, since Netanyahu took office, she has abandoned this position in favor of blanket support for the Palestinians against Netanyahu. In Livni’s world, the fact that the Palestinians have refused to hold negotiations with Israel for two years is an opportunity to attack Netanyahu. The fact that her friends in Fatah just signed a unity deal with Hamas is insignificant. As for their bid to ditch the peace process and ask the UN to recognize a Palestinian state without peace with Israel – that too is an opportunity to attack Netanyahu. Last month, Netanyahu told an interviewer that the conflict with the Palestinians is not about territory but about their rejection of Israel’s right to exist. He asserted that as a consequence, it will be impossible to resolve the conflict until they change their view of Israel. THEN THERE is Livni’s ardent support for far-Left organizations in Israel and abroad that work actively to undermine Israel’s legitimacy. Take J Street. It took less than a year for J Street to demonstrate that its claim that it is pro-Israel is a sham. J Street lobbied the US Congress not to impose sanctions on Iran. It lobbied the Obama administration to allow an anti-Israel resolution to pass at the UN Security Council. It has included advocates of the boycott, sanctions and divestment campaign against Israel at its annual conference. It supports several of the most anti- Israel members of Congress. Due to J Street’s hostility, the government has rightly shunned it. But Livni has embraced it – mainly in a bid to make Netanyahu look petty. In so doing, she has given legitimacy to a deeply hostile organization whose goals are far outside the mainstream of both Israeli public opinion and American public opinion. Then there is her outspoken support for anti- Zionist Israeli and foreign organizations that participate in the international Left’s campaign to delegitimize Israel. Many of these groups worked with the Goldstone Commission and others to criminalize Kadima’s leadership – including Livni – as war criminals. If it hadn’t been for Livni, last week the Knesset would have approved by a much wider margin an anti-boycott law that enjoyed support from across the political spectrum. Instead, it passed with the support of right-wing lawmakers alone. The original anti-boycott bill was co-sponsored by Likud MK Ze’ev Elkin and Kadima MK Dalia Itzik. Several Kadima MKs were vocal advocates of legislation punishing those waging economic war against Israel. But Livni would have none of it. By acting as she did, she didn’t merely hurt the government. She hurt the country. Now everyone from the Palestine Solidarity Campaign, to B’Tselem, to the International Solidarity Movement will cite Livni’s position as proof that there is nothing wrong with waging economic warfare against Israel. They will quote her to claim it is reasonable to single Israel out from the rest of the nations of the world for delegitimization and divestment. Livni insists that Kadima is not a leftist party and that she is not a leftist even as her positions are identical to those of the post-Zionist Meretz party. Livni’s political rationale is clear. She knows that despite her protestations, no one other than her media supporters believes that Kadima is a centrist party. As a consequence, her only chance of forming a government is by capturing the entire leftist vote. Although many Kadima MKs object to her positions and criticize her for being too radical, they realize they have no choice but to go along. If they want to remain in Kadima and in politics, they must appeal to Kadima’s voters – who are all on the Left. This is why Livni’s rival for party leadership Shaul Mofaz has adopted a peace plan that is even more radical than Livni’s plan to give Fatah everything it wants. Mofaz’s plan is to recognize and seek to negotiate a settlement with Hamas. Mofaz is no dove. But his only option for beating Livni in the Kadima leadership primary is to outflank her on the Left. Livni has always been an opportunist. When Netanyahu brought her into the Knesset in 1999, she was a super hawk. When in 2004, then-prime minister Ariel Sharon adopted the far Left’s strategy of wholesale territorial surrender, Livni moved from junior minister to senior minister in less than two years by adopting the positions of the far Left. Today, as she attacks Netanyahu for advancing positions that most Israelis agree with, she does so not because she believes Netanyahu is wrong. After all, she advanced many of the same positions when she was foreign minister. She attacks him because she wants to bring down his government so that she can have another shot at getting elected to replace him. That her behavior’s affects Israel’s ability to withstand political and military aggression is clearly of no concern to her. It is hard to quantify the damage Livni’s opportunistic attacks on the government have already caused the country. As we move into an uncertain future, it is disconcerting to consider the damage Livni will cause with her shameless exploitation of Israel’s vulnerabilities for her own political gain.